Dr. Eric Geist attended University of Maryland where he graduated with a B.S. in Zoology. 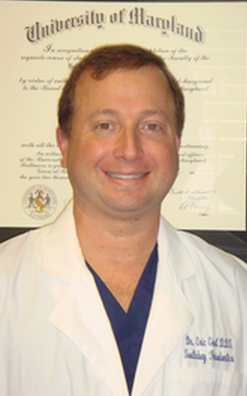 Dr. Geist earned his DDS degree at the Baltimore College of Dental Surgery which was the first dental school in the world. During dental school he was a member of American Student Dental Association, Pediatric Dental Society, Alpha Omega Dental society, school book editor, and tour guide for the University of Maryland Dental Museum. After graduation Dr. Geist did a 1 year advanced general dentistry residency where he gained advanced knowledge into all aspects of dentistry. Dr. Geist. Did his specialty training in Periodontics at the Oregon Health and Sciences University where he graduated with the schools most Outstanding Resident Award. In his goal to provide outstanding and the most advanced care Dr. Geist attends countless hours of continuing education; and is a member of American Academy of Periodontology, American Dental Association, Academy of Osseointegration, International Congress of Implantology, Western Society of Periodontology, Hillsborough Dental Society, Florida Dental Association, Florida Society of Anesthesiology, American Dental Society of Anesthesiology, the West Coast Dental Association. Dr Geist also Maintains a satellite Office in Key West.